For those of you still suffering from this extraordinary winter, when barricading yourself in the kitchen and the promise of a warm and satisfying dinner is the only thing keeping you going, this may be a great recipe for you. This is an old classic, slightly changed, but only in a few subtle ways. I’ve also incorporated a few shortcuts to make the cooking process a little less time consuming. Cassoulet. The original south of France slow cooked meat and bean stew. 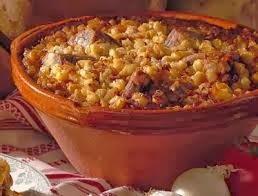 Being that the south of France is somewhat famous for it’s garlic sausage and wonderful fowl preservations, it comes as no surprise that a typical cassoulet may contain delicacies such as duck confit, French garlic sausage, lamb, bacon, pork jowl, goose, pheasant, or other game birds. Everything is slowly cooked to the peak of perfection in a rich white bean stew, sometimes finished with a lovely bread crumb topping. It cooks for hours, perfuming your kitchen with the deep and rich aroma of moist and tender meats cooking with garlic, herbs, paprika and the white beans. It’s not a slow cook, and rightfully so. You need to earn the right to enjoy something so wonderful. My version is really not that far from the classic. To make it somewhat easier, I recommend buying very high quality canned white beans and garlic sausage. I am also calling for homemade chicken confit, as opposed to duck confit because I love the flavor the chicken lends (I also love duck) and I think it’s easier and more practical to use chicken. I also love cooking it full of lamb shanks, but not everyone loves the flavor of lamb, so I am omitting, but if you love lamb, by all means, add it. The end result will not suffer. Your senses will not suffer. Your stomach will not suffer. It’s one more great recipe to help the last of the winter months pass. I hope you enjoy making and eating this as much as I do. In a mixing bowl, mix the salt, sugar, peppercorns and thyme. Evenly coat the chicken with the cure. Wrap tightly and refrigerate over night. The next day, wash the cure off the chicken and dry. Sear the chicken in vegetable oil until golden brown (be careful, the chicken will splatter oil!). Please the legs in a small stock pot, add the chicken stock, barely cover with water and simmer slowly until very tender, about 2 1/2 hours. Remove from the stock, let drain and cool. When cool enough to handle, peel the skin off and remove the meat from the bone. Coarsely shred and reserve. Place the sauce in a small sauce pot, cover with cold water, bring to a simmer and simmer for 10 minutes. Drain and cool. Slice the sauce into 1/2 inch pieces. Reserve. In a cast iron dutch oven or French casserole, begin rendering the bacon in a small amount of oil and butter. When the bacon is well rendered and crispy, add the cooked sausage and onion. When the onion becomes translucent, add the garlic and reserved thyme. When highly fragrant, deglaze the pot with the white wine. Using a wooden spoon, scrape the bottom of the pot as the wine reduces. Add the beans, tomato, reserved chicken stock, about 1 cup of reserved chicken stock and a generous amount of black pepper and paprika . Very lightly season with salt. Bring to a simmer and mix well. Turn off. Coat the top with the breadcrumbs, sprinkle a little paprika over the top and drizzle with olive oil. Cover and place in the oven. Cook for about 2 hours, or until the beans have almost completely absorbed the liquid. Uncover and cook for 1/2 hr longer to toast the breadcrumbs. Remove from the oven and let cool. Serve right away. Best with rustic French bread and either a sweet/fruity Riesling or light and aromatic pinot noir. This entry was tagged Confit, French, Soup, Stew, Winter. Bookmark the permalink.